CALGARY, Nov. 21, 2016 /CNW/ - WestJet announced today it has partnered with McDonald's® Canada in a move that will see the restaurant's McCafé Premium Roast coffee available on board WestJet aircraft. The first flight, taking place on November 21, 2016, from Toronto to Calgary, represents a global-first for McDonald's and an unprecedented next step in the McCafé coffee journey, which in recent years has continued its emphasis on providing Canadians with A New Way to Café. By December 1, WestJet will offer McCafé Premium Roast coffee across its fleet of Boeing 737NG and 767NG aircraft with the company's regional airline, WestJet Encore, to follow. Both companies' high standards for quality and guest satisfaction were reflected in developing new brewing procedures on-board. The result is a uniquely rich, bold taste of McCafé Premium Roast Coffee that will surprise and delight guests on WestJet flights. 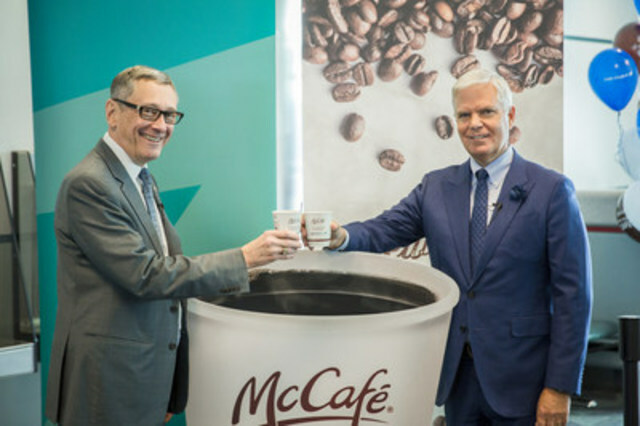 "We are delighted to bring a new way to café on board WestJet and know that our 21 million guests per year will enjoy the taste of a complimentary McCafé Premium Roast Coffee wherever they are flying," said Gregg Saretsky, WestJet President and CEO. "The collaboration between our two caring brands is a perfect pairing, as McCafé's values are reflected in WestJet's commitment to offer an unmatched guest experience." "We've always believed that the sky is the limit for McCafé – and today this officially rings true," said John Betts, McDonald's Canada, President and CEO. "We're proud that Canadians have welcomed McCafé into their homes and daily routines, and now our partnership with WestJet lets us take this connection to even greater heights for Canadian coffee lovers." With more than 140 aircraft, the partnership will serve approximately 30,000 cups of McCafé Premium Roast coffee to WestJet guests, every day. Coffee on board WestJet aircraft is served in a McCafé signature double-walled cup, which will have the same highly popular on-cup rewards collector card and peelable sticker, redeemable upon completion at participating Canadian McDonald's restaurants. The unique cups feature a special McCafé and WestJet design and will be offered for the first time on-board with a lid as a courtesy on request. With McDonald's Canada, WestJet found a Canadian partner that shares a focus on community, including through an existing and strong relationship with Ronald McDonald House Charities® Canada. Both companies are consistently among Canada's Top Employers. We are proud to be Canada's most trusted airline, powered by an award-winning culture of care and recognized as one of the country's top employers. WestJet, and our regional airline, WestJet Encore, offer scheduled service to more than 100 destinations in North America, Central America, the Caribbean and Europe. Through our partnerships with airlines representing every major region of the world, we offer our guests more than 150 destinations in more than 20 countries. Leveraging WestJet's extensive network, flight schedule and remarkable guest experience, WestJet Vacations delivers affordable, flexible travel experiences with a variety of accommodation options for every guest. Members of our WestJet Rewards program earn WestJet dollars on flights, vacation packages and more. Our members use WestJet dollars towards the purchase of WestJet flights and vacations packages on any day, at any time, to any WestJet destination with no blackout periods ̶ even on seat sales. For more information about everything WestJet, please visit westjet.com. For further information: Media contacts: To contact McDonald's Canada, please contact: Adam Grachnik, adam.grachnik@ca.mcd.com; or McDonald's Media Relations Line, media.relations@ca.mcd.com, 1-877-786-3342; To contact WestJet media relations, please contact: media@westjet.com.